WE HAVE A MATCHING GRANT FOR UP TO $15,000 through January! If you're going to donate, please do so soon and our awesome supporter will match you dollar for dollar! Thanks so much for all the generous support so far. We have raised a total of about $25,000! Thought the figures on this online fundraiser appear lower, we are meeting with great success. Now we’re raising funds for infrastructure and programs. We’re fortunate to have found a beautiful farm and we think it's the perfect place for people from different social movements and society at large to meet each other, work together, and make commitments to shaping a livable future. - Purchased a 160+ acre farm! - Done tons of cleanup, repairs, and are moving ahead with program startup. Check our a lot more of what we're up to a HERE. Thanks again to everyone who has put in the sweat and funds so far! We're rolling!!! Find out more on our MISSION page. Here's a list of projects that we're working on, followed by other opportunities that may be a good match for support from specific funders. * The Barn: Insulation, Repair, and a New Floor - $22,000: We are removing the dairy infrastructure from the cow barn, insulating and installing a new floor in this beautiful 88 foot by 36 foot space! The view is excellent from this spot, and having a level insulated floor will be our real entry into being able to host large movement groups and events at the center YEAR-ROUND! The new floor is key, and we can do the installation with $13,000 in materials. * Tractor Implements & Maintenance- $3,000: We have a brand new 4-wheel-drive John Deere committed to the project! We need harrows and to cover on-going maintenance costs of this awesome piece of equipment. * Cleanup - $1,300: Basically a few industrial dumpster loads of trash and debris need to be removed, and we need to buy food for the volunteers and work parties that are going to help make that happen. * Sugarbush Prep - $13,000: 15 acres of Saplines, taps, and the collection tanks! These efforts will make a major difference in the feeling and the usability of the place. There’s so much more. If you’d like to see our budget or agriculture business plan just ask. Help us out, or get in touch if you would like your donation to go to a specific project. A Steering Council has assembled to provide support and accountability to this broad effort. The farm is an important aspect of the project, and is oriented toward the challenging prospects in the future of agriculture. -> We are looking for farmers to come and get some projects rolling here, potentially structured as a temporary free lease on acreage. The threats of economic, political, and climate crisis are mainstream, but plans to cope with these issues are rare. The climate crisis is already showing up as agricultural collapse and market breakdowns all over the world. Our response is to show what can be done with land and people dedicated to their relationship to it, building explicit relationships between resilient agro-ecology and the social movements that depend on it. 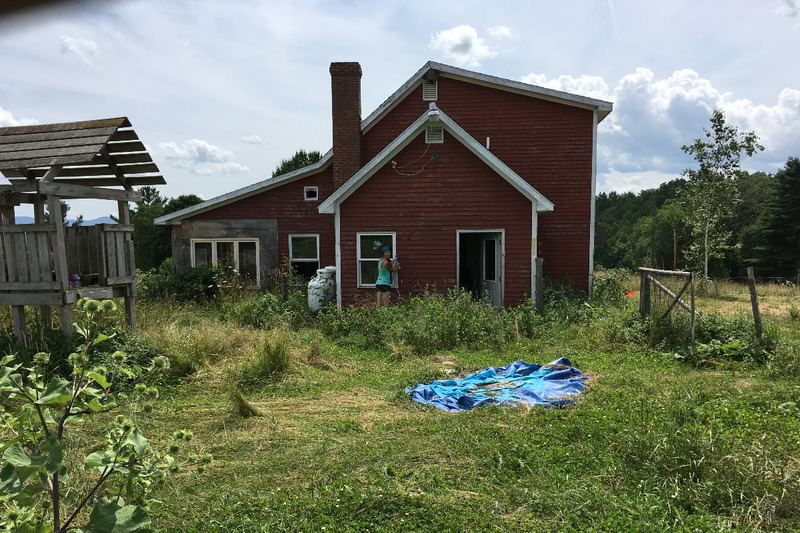 Immediately we’re planning on building a big greenhouse, repairing the barns, preparing 15 acres of sugarbush for sap collection, and planting out medicinal Herbs, blueberries, asparagus, and other perennials. We're already grazing 30 dairy cows to rejuvenate the pasture land. We're also asking for proposals from farmers and others for projects on the farm. We're looking for productive, educational agricultural projects that address different elements of climate crisis and a more just distribution of resources. We intend to build and promote rugged and cooperative agricultural systems for the long haul. Visitors will work on the farm and learn about food-based cooperative economics and resilience in the climate crisis. Our measure of agricultural success is how many people we can get involved in sustaining agriculture on site, and ultimately we’d like to be part of this work all over the region. We’re involved in many hubs of social justice and grassroots organizing in Vermont, the Northeast, and across the US. I have a lot of confidence that the people and networks already connected to this project will accomplish amazing things together on this hilltop, not to mention the with new people they’ll bring in. I have deep gratitude for the family and old friends who been involved so far. So much thanks to Marita Canedo, Jack Lazor, Jade Walker, Tom Gilbert, Ashanti Alston (who helped start this dream so long ago), Earl Kooperkamp, Corine Fairbanks, and too many others to list for their encouragement and ongoing support. I’m very excited to see what they come up with as our doors open. This effort is coming together in response to an unexpected opportunity, so planning will be in full swing after we get moved in! Feel free to get in touch, and expect more invitations to get involved. In the meantime please get generous with this fundraiser and help us get started on the work. Let us know if you’d like us to add you to our updates list. organizeresilience@gmail.com. I hope this note finds you working hard and having a good time. Maybe we'll get a chance to do those things together before long. Ps - I would like to dedicate this first attempt to describe what we’re trying to do to the inspiration of Ella Baker and Myles Horton, to the example set by the Caracoles Movement in Chiapas, MX and to Joe Lee. Big News! We signed the closing papers on Friday and bought the land! We are so grateful to all of you for your support and encouragement. We're going into the real work of stewarding this land and seeing what we can do to make this place a social movement resource. Please let your friends know about the project, and come up for a visit some time. The ticker reads $3,500, That's just part of about $16,000 we've pulled together. Our Minimum Goal is to meet the downpayment and closing costs of $25,000 so we're more than half way there! Nobody saw this chance coming, and it's coming pretty fast. The downpayment and taxes have to be in-hand at the closing on August Twenty-Second. We're $10,000 away. That's so doable. I think we'll raise a lot more to get the place ready before the New Year, but the purchase has to happen this month. WE WILL DEFINITELY RAISE THIS MONEY IF ALL OF YOU SEND A NOTE, OR POST A POST, ABOUT TRYING TO GET THIS LAND AND MAKE THIS ORGANIZING CENTER AVAILABLE TO PEOPLE DOING GOOD WORK. We have to support responses to the crisis, and develop cooperative alternatives. Farming, organizing, action, and everything else you already know. Help make this space be part of that strategy. If you want to drop $20 - $50 bucks while you're passing this along, great. I don't know what to say, I think it's a good idea. We've all talked about needing a place like this for a years, and we have this chance for a quite large piece of land with some infrastructure. It's a really good bet. This is just one potential starting point, and we have to play every hand we get. So I should add that I do have a reputation for very hard work and involving a broad network of people in projects. We’ll be sending out some info from the council that’s forming to oversee the activities on the site, a very accomplished group of people that I’m honored by and exciting to see coming together. The work leading up to this center has been with many of you, working with our different teams on coordinated mass actions, political pressure, pushing back corporations and exposing government, and trying to support each other in the elusive work of creating a rational society. So many networks of us have thrived together in big and incredibly democratic work we've found together all over the country. It's been amazing. This work takes some planning, and we need another place to do it. Let's get this spot to do more of that, to double down, and to actually get together. Let's make a place to support the legwork that goes into getting us together here and in many other places. As in, yes YOU. Please actually come and be involved in this. We need to re-convene our in-real-life relationships, to strengthen trust and friendship, to commit to some time together, to make plans AND to execute them. We need a place that is going to stay wide open to this work and to the people who do it. A bunch of you are still in the struggle, or are are coming back, and I think a bunch of you are actually likely to come visit, which is so exciting! And I recognize all the new people who are waking up to the crisis every day and making commitments to deal with it. I want to see a place that is structured to serve all these people as much as possible. That's more than enough out of me. Thanks so much for the love and support. Hi friends - Thanks for all the support so far! I've been meeting with some funders for larger sums of money, and it looks like that's going to pay off! I still need to close the gap, though. I'm writing to ask if you would all be willing to post on your facebook page that you donated to my campaign, and maybe say why, along with the link. https://www.gofundme.com/a-center-for-grassroots-organizing. 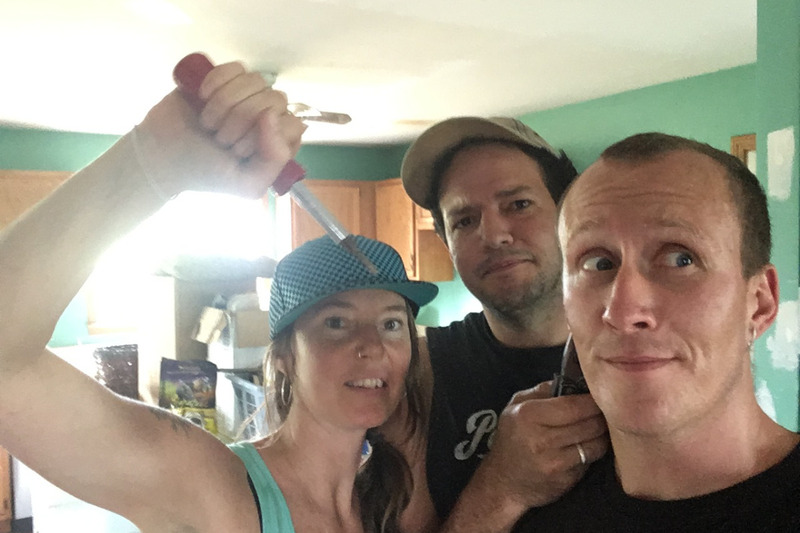 Here's a couple shots from our first work party!